After securing the fourth spot in the Réseau du sport étudiant du Québec conference last week, the Stingers took on the first-place Martlets over the weekend in their penultimate regular season game. What started out as a close contest ended up being a blowout, as the Stingers lost 6-2. “When we play [McGill] they’re always really good intense games, everyone gets really involved,” said Stingers team captain Erin Lally who, despite Sunday’s loss, is already excited for a rematch. In their five games against McGill this season—all losses—Concordia was outscored a combined 23-7. Though the statistics show they lost by four goals over the weekend, the Stingers nonetheless showed they can hold their own against the no. 1 team in the entire Canadian Interuniversity Sport. Not even five minutes into the game, Stingers centre Alyssa Sherrard was penalized for bodychecking, giving McGill an early power play. But the Martlets weren’t able to get a clear shot on goal for the entire two minutes, and by the end of their power play had accrued a penalty of their own by forward Chelsey Saunders. Both penalized players came back later in the period to score goals; Saunders scored first, but the goal was swiftly followed by one from Sherrard, tying up the game at 1-1. The tie didn’t last long, however. Early in the second period, Martlets senior forward Logan Murray scored in the final seconds of a power play. After a string of incredible saves by Stingers rookie goalie Briar Bache, McGill found the back of the net three more times in the period to take a 5-1 lead into the final frame. “We had about 10 minutes in the second period where it just cost us a lot of goals,” said Concordia head coach Les Lawton. The game wrapped up with one more goal for McGill and Concordia each in the third period, finishing 6-2. 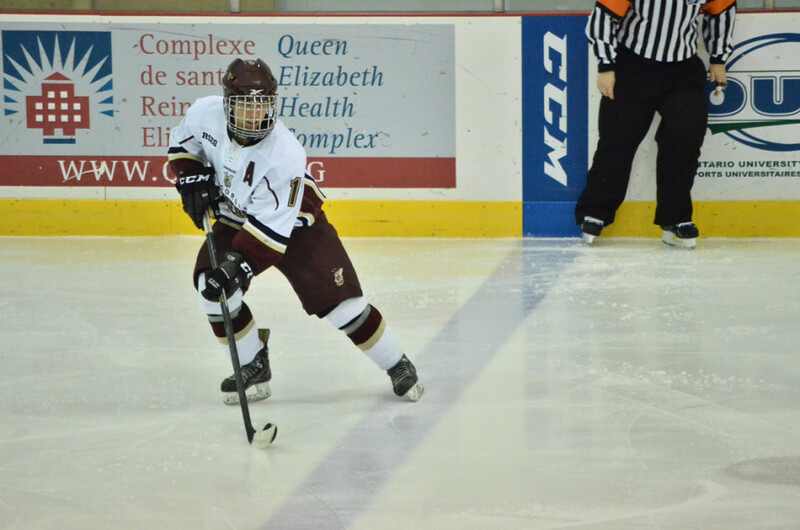 Both Stinger goals were scored by fourth-year centre Alyssa Sherrard, who leads the team with 14 points. Despite the loss, Lawton has high hopes for the postseason. “[The Martlets are] one of the top teams in the country and hopefully we can put ourselves in a position where we can steal a game or two and win,” he said. The Stingers conclude their regular season on Friday, Feb. 14 at 7:30 p.m. against the Ottawa Gee-Gees at the Ed Meagher Arena.